Chronic low back pain is more than just a muscle or joint problem. There is big difference between the treatment of acute pain (short term, first time and one off) v.s. chronic pain (long term and recurrent). If your back pain has been present for more than 6 months and associated with acute relapses during this time it means that you fall into the chronic pain category. With that distinction must come a different chiropractic approach. People with chronic back pain show structural brain changes. Studies have shown measurable losses of brain tissue in areas associated with body awareness, higher cognition and emotional decision making in people with ongoing back pain. People with chronic back pain have distorted body control. Studies have shown chronic back pain sufferers lose control of the muscles that protect the back, making them even more susceptible to injury. People with chronic back pain are more sensitive to pain. Studies have shown that chronic pain suffered become pain sensitive to stimuli which is normally non-painful, such as touch, sound, smell and taste. This occurs through a process of sensitisation at multiple brain sites whereby neural circuits that process information such as pain become overactive. People with chronic back pain have altered brain chemistry. Given this, it is not surprising that with chronic pain one can have a feeling of simply “being down” or as severe as being clinically depressed. The levels of key neurotransmitters such as serotonin, noradrenaline and dopamine all have been shown to be affected in chronic pain sufferers. Even more interesting is that the evidence seems to suggest that CBP is what comes first and causes the chemical changes in the brain rather than the other way around. So, what does this mean for you as a Chiropractic patient looking for a solution to your problem? Firstly, chronic pain is not just a joint or muscle problem. This means that the priority for the successful chiropractic treatment of your injury lies in our ability stimulate better brain function. 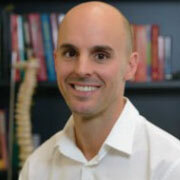 Chiropractic adjustments take a global approach and not just a focus on where you think the pain is. 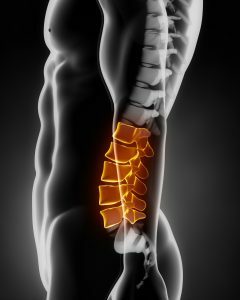 Chronic spinal injury no matter where, can be the result of a global positioning problem and therefore may be assisted by aligning your joints so that they are working better. Unfortunately, this is why many people fail to respond to treatments that are focused solely upon the injured area. Secondly, because we are dealing with neuroplastic changes that have occurred in the brain, as well as the original injury to the tissues concerned, your persistence is the key. In many cases it can take many months of work both in the clinic and at home for the brain based changes to take place and the benefits to become obvious. Short term expectations only lead to frustration and disappointment. Finally, frequency is everything. When the focus is upon normalising brain function, chiropractic adjustments along with supportive exercises need to be repeated at very specific time frames. Corrective adjustments that stimulate neural pathways of joint positioning and pain perception may need to be performed as often as 3-4 times per week in the early months although treatment must be tailored to your particular condition.